In 2031, the majority of Gen-Zers will hit their prime homebuying age at 30. But will they even be able to afford a home? Maybe, but only if they start saving now. According to a realtor.com study released on Thursday, the average Gen-Zer will need to save $304 per month for the next 12 years to afford a 10 percent down payment and closing costs for a median-priced home ($386,310) by the time they’re 30. This assumes that home prices will only grow 3.2 percent year-over-year each year for the next decade. If $304 per month sounds steep for an 18-year-old, it’s a bargain compared to what Gen-Zers on West Coast will have to stash away to achieve their home buying goals. 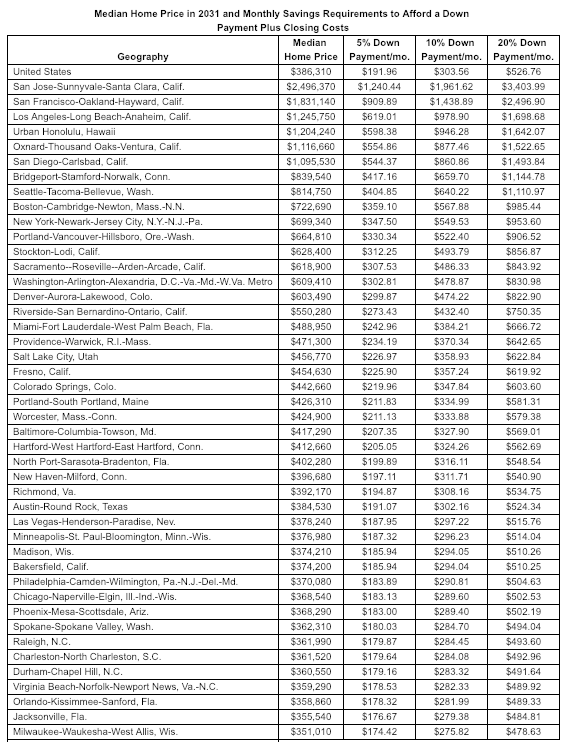 San Jose is the most expensive market, with an estimated monthly savings goal of $1,962 per month to afford a median-priced home of $2,496,370. San Francisco is the second most expensive market with a monthly savings goal of $1,439 to afford a median-priced home of $1,831,140. Los Angeles ($979/mo. ), Honolulu ($946/mo. ), and Oxnard, Calif. ($877/mo.) round out the top five highest monthly savings goals with median home prices of at least $1,116,660. Overall, Gen-Zers in the top 10 most expensive metros will need to need to save at least $948 per month to become a homeowner by the age of 30. Meanwhile, Gen-Zers living in the 10 most affordable metros where the median home price is estimated to reach $191,381 by 2031, will only need to save a $150 per month. This analysis assumed an 18-year-old member of Generation Z started saving on his or her birthday, contributing the exact amount every month into a savings account with a fixed three percent annual return, compounded monthly. They will make their home purchase in 2031 on their 30th birthday, after making exactly 144 deposits over exactly 12 years. The calculated savings amount required includes money for a downpayment and typical closing costs of about 3.6 percent for first-time home buyers. Forecast median home price data comes from Moody’s Analytics (economy.com).